This living room screams Palm Beach chic and I love every inch of it! 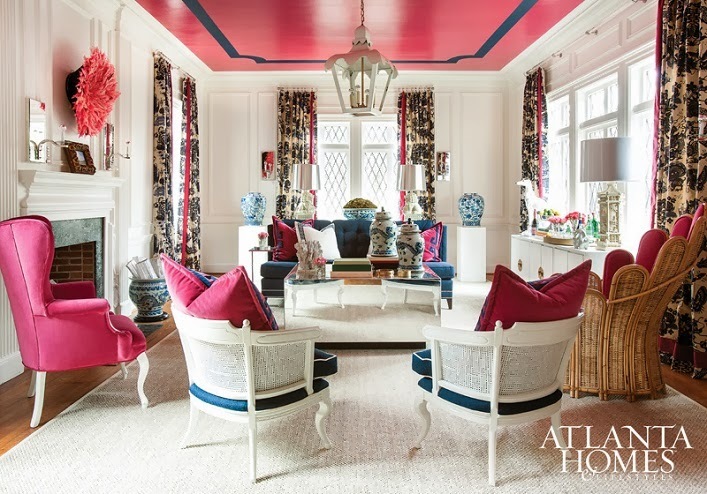 Designed by Lance Jackson and David Ecton, I am absolutely swooning over the fun and classic preppy vibe. It is modern and refreshing. Most importantly, no details are overlooked. I am particularly drawn to the exciting color palette, those fabulous painted ceiling, the ribbon-trimmed curtains and the overall styling! Are you a fan of this gorgeous room as well? What a fun room! Digging the ceiling & cray, cray over the colors! I love this room as it is so vibrant and fresh! Gorgeous use of navy and fuchsia as well!